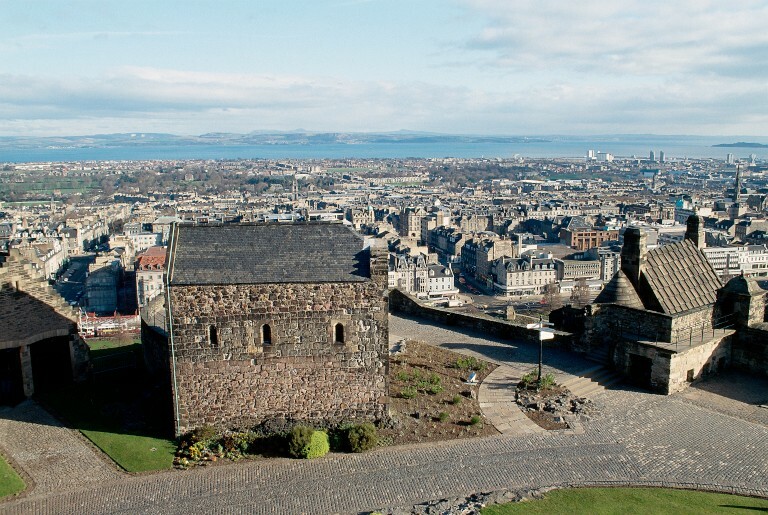 This Thursday Historic Environment Scotland are celebrating Scotland’s historic connections with the rest of Europe as part of Heritage Awareness Day 2018 – and where better to start than Edinburgh Castle? We’ve explored some of our favourite #ScottishConnections below. Let us know on social media if we’ve missed anything out – don’t forget to use the hashtag! Edinburgh Castle has been used to hold prisoners of war for centuries. Since the 18th century, French, Dutch, Spanish, Irish and German prisoners of war have all been locked up in the prison vaults. 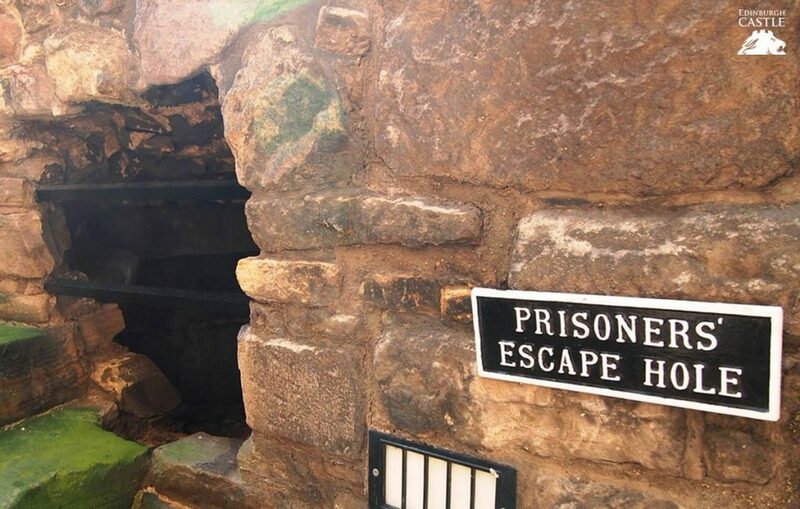 In 1811, 49 prisoners made a dramatic escape when they hacked their way through one of castle walls and lowered themselves on ropes down the steep Castle Rock. All but one escaped. The site of their daring escape can still be seen today. On his 2nd-century map of Britain Greco-Roman geographer Ptolemy marked a settlement called “Alauna” (“rock place”) on the spot known today as Castle Rock. The settlement belonged to Celtic people known as the Votadini. 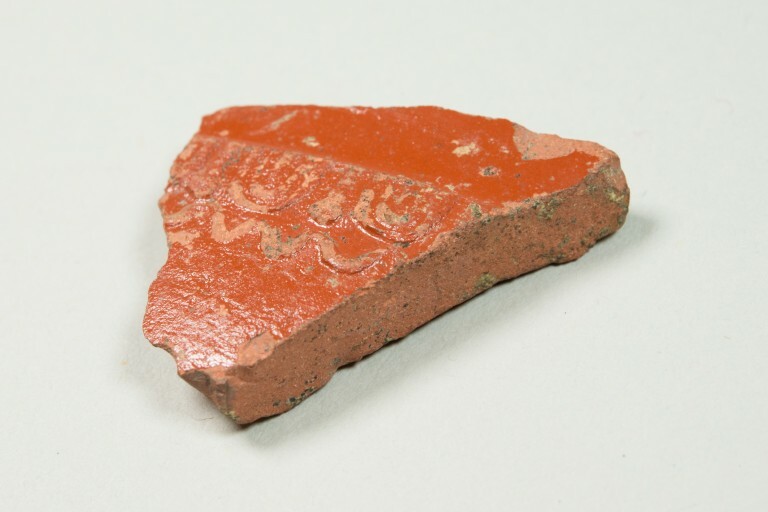 An archaeological dig in the early 1990s unearthed Roman material including pottery and brooches, suggesting that the residents of “Alauna” may have interacted and traded with the Romans. Inspired by the Roman army, Napoleon presented a gilded bronze eagle to all of his regiments between 1803 and 1815. These eagles acted as rallying points and a source of regimental pride for French soldiers, who would defend them to the hilt if attacked. One such French Eagle was captured by Charles Ewart during a cavalry charge. “Ewart’s Eagle” is one of the treasures of the Royal Scots Dragoon Guards Museum. 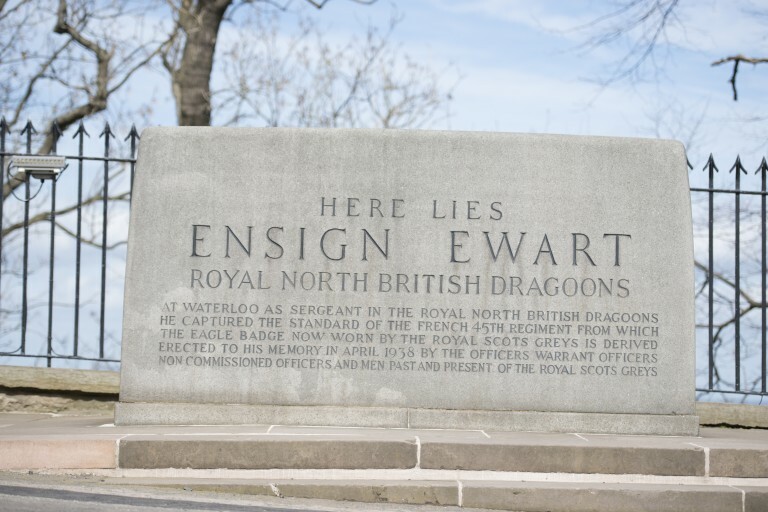 Ensign Ewart died March 23rd, 1846 aged 77. His gravestone can be seen at the Castle and features a carving of an eagle and the date 1815. Built David I in around 1130, a small chapel in the Castle is the oldest building in Edinburgh. It is dedicated to Saint Margaret, Queen consort of Scotland from 1070 to 1093. Margaret was born and in the Kingdom of Hungary spent much of her childhood there before travelling to England in 1057. Her family fled to Scotland after the Norman conquest in 1066. Four years later she married King Malcolm III and became the mother of three future Scottish kings. A devoted Catholic, Margaret established a ferry across the Firth of Forth for pilgrims travelling to St. Andrew’s Cathedral. North Queensferry and South Queensferry are named in her honour. Edinburgh Castle houses the Honours of Scotland, Britain’s oldest crown jewels. There are three primary elements to the Honours: the crown, the sceptre and the Sword of State. The sword was a Papal gift to King James IV from Pope Julius II in recognition of his defence of the Christendom. Presented in 1507, the sword’s blade is almost a metre in length and is decorated with images of Saint Peter and Saint Paul along with oak leaves, acorns and dolphins. 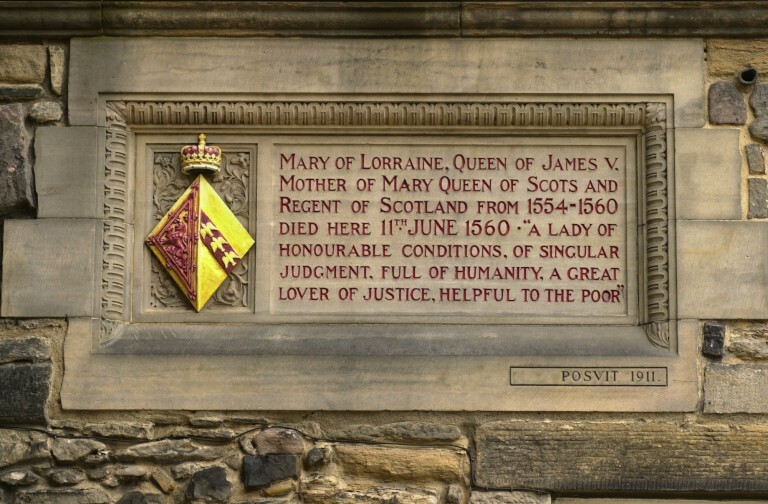 Mary of Guise, also known as Mary of Lorraine, was born in the town of Bar-le-Duc, France, in 1515. In 1537, she received marriage proposals from both James V of Scotland and Henry VIII of England. The Catholic French crown accepted James’ proposal and the pair were married by proxy in on 9 May 1538. Aged just 22, Mary left France for Scotland the following month. Her coronation as Scottish queen at Holyrood Abbey in October featured a 30-gun salute from David’s Tower in Edinburgh Castle and fireworks which James himself helped to devise. The King died six days after the birth of the couple’s third child, Mary, leaving the infant as the new queen of Scotland. Mary de Guise acted as regent for her daughter from 1554 to 1560, a period in which her power was challenged by the growing influence of Scottish Protestants. In 1560, while staying at Edinburgh Castle, Mary fell seriously ill. She died on 11 June 1560 and was laid to rest in St Margaret’s Chapel. A stone plaque in the corner of Crown Square records the event. Her body was later taken to Rheims in her native France for burial. 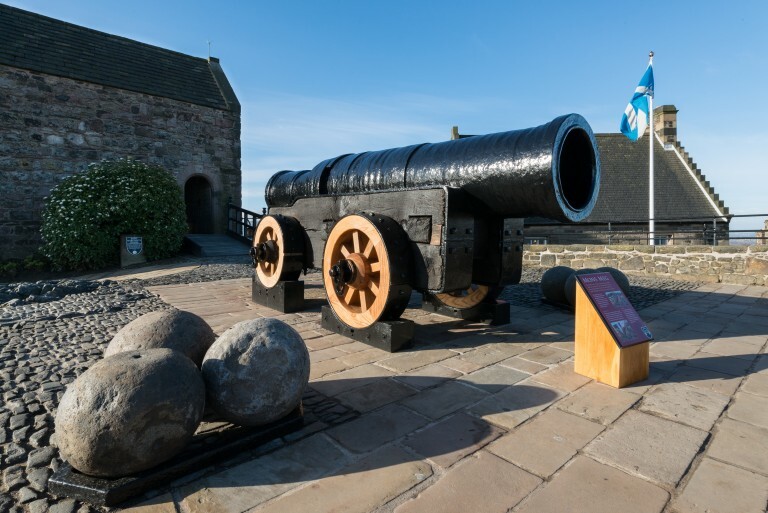 Visitors to Edinburgh Castle can hardly miss Mons Meg, one of the largest cannons in the world. Mons Meg was constructed by an artillery maker called Jehan Cambier in the Belgian town of Mons in 1449. It was given to King James II by the Duke of Burgundy in 1457 and was used in sieges until the middle of the 16th century. After this, Mons Meg was used as a ceremonial gun until her barrel burst in 1681, during a salute welcoming the future James VII & II to Edinburgh. The gun lay neglected and was removed to London in 1754. It returned to Scotland in 1828 after a campaign led by Sir Walter Scott. 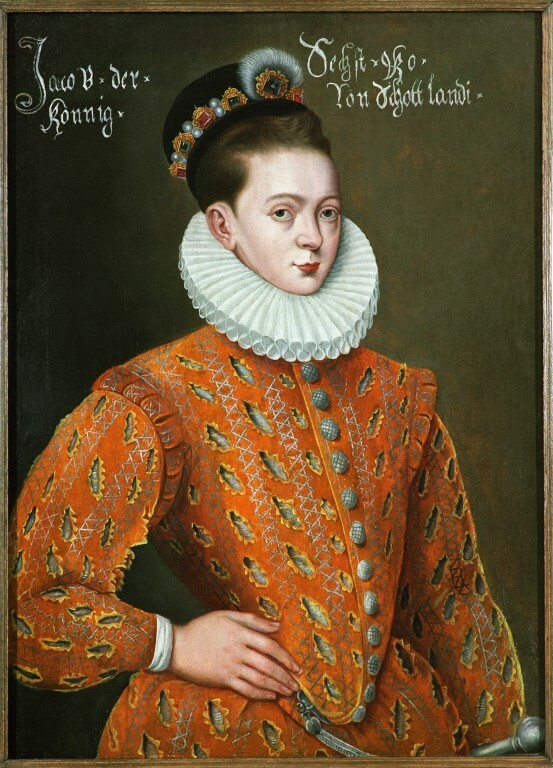 This early portrait of James VI dating from around 1585 hangs in Edinburgh Castle. It is thought that this portrait was sent to the Danish court to attract a royal bride – a 16th-century dating profile picture! The portrait is by Adrian Vanson, court painter to James IV. Vanson is believed to have been born in Breda in the Netherlands and his wife, Susanna de Colonia, was an active business woman in Edinburgh. Eurovision organisers asked the BBC to host the 1972 contest after Monaco, which had won the previous year, was unable to provide a suitable venue. Edinburgh was chosen as the first British location outside of London to host the show. Acts from 18 European nations performed in the Usher Hall on Lothian Road. The United Kingdom was represented by The New Seekers singing “Beg, Steal or Borrow” and finished in second place. The winner was Greek-born Vicky Leandros (pictured below), singing for Luxembourg with a tune called “Après Toi” (“After You”). A Tattoo was performed on the Castle Esplanade as interval act and jurors from each nation made their votes from inside the Castle. 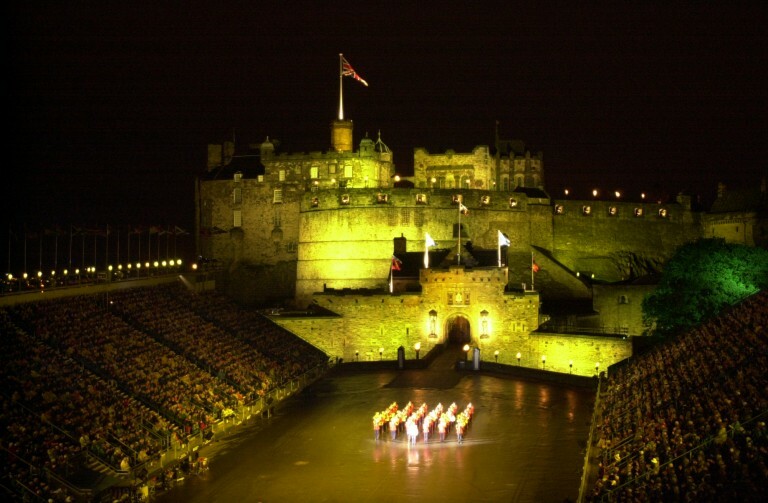 The Royal Edinburgh Military Tattoo, held annually at Edinburgh Castle, is famous all over the world. But did you know that the term “tattoo” originated in the Netherlands? It derives from the 17th-century Dutch phrase “doe den tap toe” which translates to “turn off the tap.” This referred to a signal played by military musicians for tavern owners to turn off the taps on their ale kegs, allowing soldiers to go to bed at a reasonable hour! The term “tattoo” became associated with the last duty call of the day and evening entertainment provided by military bands. Throughout history, monarchs have felt it necessary to eavesdrop on their visitors in case of any plots against them. In Scotland, peepholes known as “laird’s lugs” were often built into castles and great houses for this purpose. 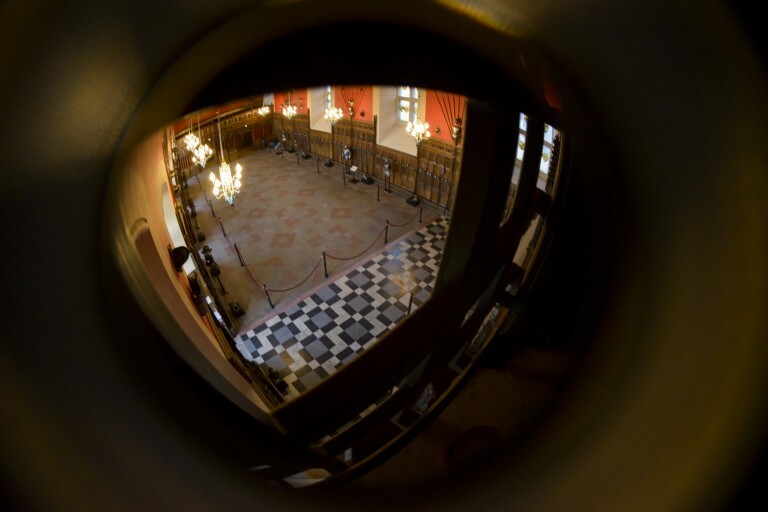 A “laird’s lug” can still be spotted high on the wall of the Great Hall in Edinburgh Castle.It’s said that King James IV was able to overhear whatever went on in the room just by listening at a little barred window near the fireplace. Ahead of a proposed visit by Mikhail Gorbachev in 1984, the KGB requested that it be bricked up just in case any 20th-century agents planned on listening in! From the prehistoric to the present, Scotland’s traditions, places and people have been intertwined with our European neighbours. We have shaped – and been shaped by – Europe over the centuries. For Heritage Awareness Day on Thursday 20 September 2018, in the European Year of Cultural Heritage, we’re inviting you to join us in sharing and celebrating these historic connections between Scotland and Europe. On Thursday 20 September, we’d love to hear your favourite connection with Europe. Join in the conversation on social media and tell us what you’ve discovered with the hashtag #ScottishConnections on Twitter and Instagram.